9 Ways to Protect your Child’s Vision – Dr. Maryann Youssef, O.D. March 26, 2019 March 26, 2019 Maryann Youssef, O.D. No one knows their child better than you! In this blog, I want to empower you and your loved ones by offering some simple guidelines that may help prevent potential vision related learning issues. Did you know vision and learning are closely related? Nearly 80% of what a child learns is obtained visually! Poor vision can negatively impact academic performance and following my guidelines below can help you and your loved ones protect their precious vision! We owe it to our children to be proactive in preventing vision related learning issues. Listed below are 9 ways to protect your child’s vision. Reduce near activities – If your kids spend a substantial amount of time reading, on the computer or any other close visual activities they have a higher likelihood of developing myopia, also known as nearsightedness. A certain amount of near activities are required, but after homework is done, consider giving their eyes a break from near work. See my blog on Computer Vision Syndrome to learn more about how to prevent eyestrain when using a digital device. Play outside – Studies suggest that a certain amount of UV sunlight exposure is associated with REDUCING the risk of myopia. Just a couple of hours per day of outdoor activities can prevent myopia development. There are many other health benefits to outdoor activities as well. Make sure you are being sun-smart with sunscreen. Get an eye exam– Eye specialists are trained to look for specific abnormalities in the pediatric population. Your kids don’t know how well they can see! Visual abnormalities are not as obvious as a wound or injury might be and it can be difficult for parents to detect as well. Obvious anomalies, such as eye turns, are more successfully treated at a younger age. See the list at the end of this article for signs you can look out for. The American Optometric Association has teamed up with Johnson & Johnson to provide FREE eye exams for infants 6-12 months old. To find a participating doctor, visit www.infantsee.org. Let them choose. Kids wont wear them unless they like them. Maybe get yourself a matching pair! If they see you wearing them they’ll be more likely to imitate. Healthy Diet – Encourage a diet rich in fruits, vegetables (especially dark leafy green veggies) and omega 3 fatty acids. Eating a healthy diet can prevent many eye diseases for people of all ages. Some of these diseases include macular degeneration, cataracts, and dry eye disease. A healthy diet will also promote a healthy body weight as obesity can lead to diabetes, which can cause severe vision complications. See my blog on Diabetes and your Diet for a list of food suggestions. Know your genes – Know your family eye history. Most conditions are genetic therefore knowing which conditions your kids are at a higher risk for can be very useful. Tell your optometrist so they can monitor appropriately. Maintain proper hygiene – Make sure to instill the habit of washing hands regularly and to avoid rubbing their eyes with their hands. This can help avoid conditions such as pink eye, which is very contagious, especially at school. Vision Therapy Exercises: Vision therapy, VT, is like physical therapy for the eyes. It usually involves an individualized vision exercise program created by your optometrist to focus on your child’s specific visual concern. Although it is most effective with children, it can also be very helpful to adults as well. Vision therapy includes memory games, focusing tasks, and other eye muscle movement exercises. If you notice your child having any of these signs & symptoms, be sure to mention them to their optometrist, as vision therapy may be needed. At home, you can use these techniques preventatively by providing visually stimulating toys that improve hand-eye coordination. Examples are building blocks, puzzles, and finger paint. Based on my experience, being a great role model can make an enormous impact on your kids. Getting your own eyes examined regularly is a strong way to help ensure a lifetime of healthy eyes for you and your family! Disclaimer: This site is provided for informational purposes only and is not intended to be a substitute for medical care. This site is not intended to provide specific medical advice, diagnosis, or treatment. If you act on any advice rendered on this website, you do so strictly out of your own volition. Make an appointment with your optometrist or healthcare provider with any questions you may have regarding a specific medical condition. Never disregard professional medical advice or delay in seeking it because of something you have read on this blog. I have no financial incentives and I do not receive any compensation for the products listed in this blog. Published by Maryann Youssef, O.D. 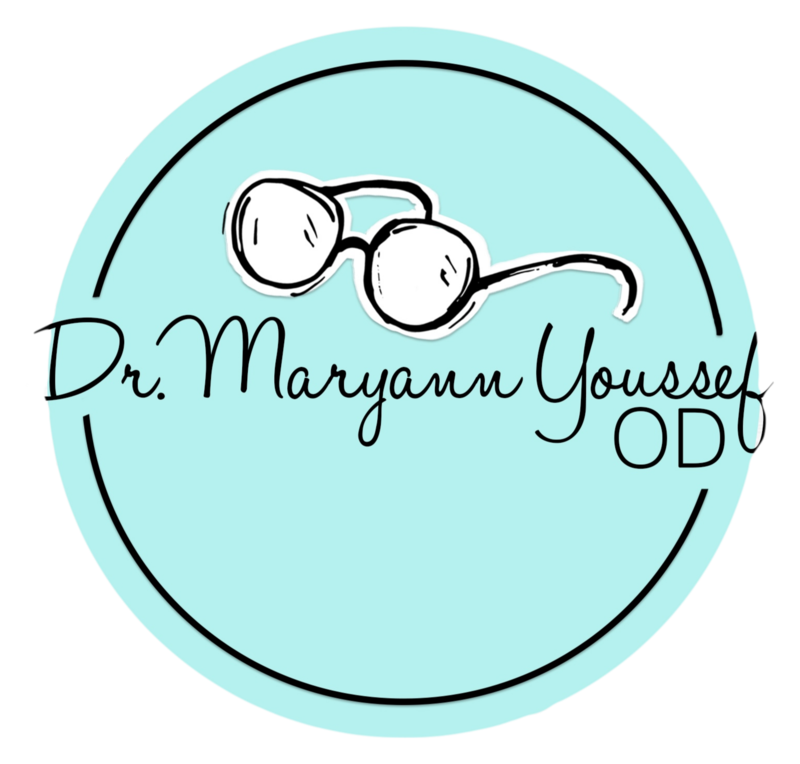 View all posts by Maryann Youssef, O.D.